On a scruffy basketball court in south Lebanon, a few dozen people shuffle their way to the front of an orderly queue where most collect a piece of paper and leave. A few, perhaps a quarter, are told to join the second line. They are Syrian refugees expecting to pick up their monthly food vouchers at one of the dozens of makeshift distribution centres across the country. In the second line, two NGO workers explain in detail why the select group of refugees will be cut off from food aid, and give them an appeal form if they want to challenge the decision. Lebanon, now home to 789,000 Syrians registered as refugees or awaiting registration, is stretched to breaking point. At least one in five people in the country of little over four million is now a Syrian, as tens of thousands of families flee the increasingly bloody civil war next door. Across the region, countries neighbouring Syria are struggling to cope with the staggering number of refugees, who have strained health, education and other infrastructure. As more refugees stream over the border every day, the UN is beginning to prioritize the most vulnerable. Starting this month, the World Food Programme (WFP) has stopped distributing food vouchers to around 30 percent of Syrian refugees in Lebanon, or more than 200,000 people, who the UN says are not dependent on the aid they receive. “It’s not about cutting food assistance,” says Laure Chadraoui, public information officer with WFP in Lebanon, but making better use of the available resources. The challenge agencies face is how to make sure that the targeting of those in need is accurate. Fatima, a mother of two small children, has been directed to the second line. Her husband works in a bakery in the capital Beirut making US$300 a month, sleeping in a room next door. They cannot afford to rent a place there, so she and the children live 90km further south in Tyre, an impoverished city that still bears the scars of the 2006 Israeli assault. He sends her what he can, but after living costs he does not have much to spare, so her family survives on support from the UN, mostly food vouchers. Already the $27 per person monthly food allowance does not go far in a country where prices of basic staples are considerably higher than in Syria. A kilogram of rice, sugar, tomatoes, cucumbers and other basics costs $1-2 each. Meat and fish are often too expensive for the budget. 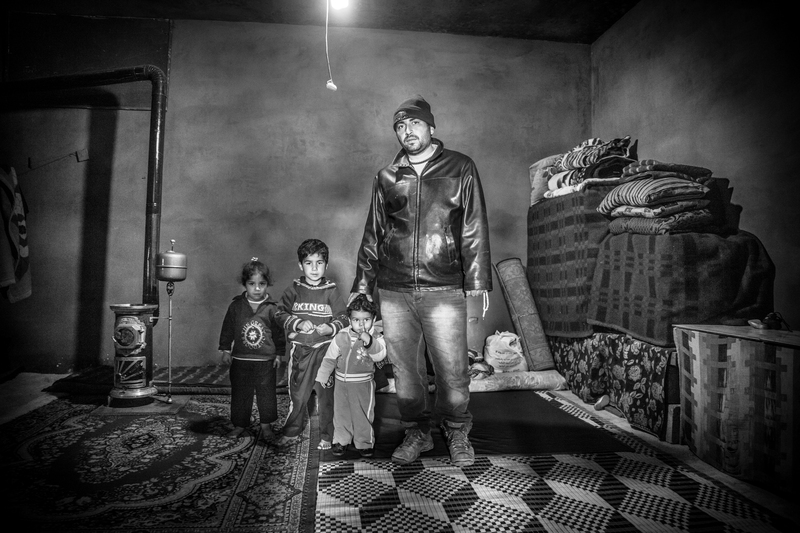 Further down the line Mohammed, a frustrated 32-year-old from Idlib in northern Syria, is also facing a cut. The charity workers seek to calm him down by explaining that he can appeal against the decision, but he has little time for their arguments. “Why me? I don’t have anything,” he protested, explaining that he left his family behind to seek work in southern Lebanon but has been unemployed for six months. He now shares a room with five other men. “I was going to bring my two children here to get away [from the war]. I don’t think I will any more,” he said, crumpling the appeal form in his hands. The cutbacks come in the context of limited financial resources for the Syrian aid operation. The UN and the Lebanese government have appealed for $1.2 billion and $450 million respectively to care for the refugees throughout 2013. To date, the UN and its partners have received 44 percent of their appeal for Lebanon, while the government has received none of its desired funding, according to the UN Refugee Agency (UNHCR). But UNHCR and WFP argue the “targeting” exercise – common in all emergencies – is due to more than simply financial considerations. “Even if we were 100 percent funded, we would still do targeted assistance,” says Chadraoui. In May and June, WFP, UNHCR and the UN Children’s Fund (UNICEF) surveyed 1,400 refugee households to assess vulnerability and found than 68 percent of them were entirely dependent on the assistance they were receiving. The other 32 percent could support themselves - either because they have jobs or have families or friends that can provide for them. According to Chadraoui, at initial stages of an emergency, determining who is truly in need can be more costly than assisting everyone. But as the scale of a crisis grows, and more information becomes available, targeting becomes more important. Now, even newly registered refugees will go through a process to determine whether they require food assistance or can provide for themselves. Other forms of aid are also being cut for many refugees, particularly hygiene kits and baby kits. UNHCR had already reduced the percentage of hospitalization covered from 85 to 75 percent in April, and like other sectors of assistance, healthcare has long been targeted to the most vulnerable – meaning not everyone received it. But the food vouchers are the most potentially dangerous, with charities already warning that malnutrition is on the rise. "In some parts of the country there are people sleeping in tents,” added Joseph Matta, head of the Lebanese charity Salam Association, which provides health care for refugees in marginal communities outside of the main cities. “We need to make sure they get more support, not less." Part of the concern is over the difficulty of gathering the detailed data needed to determine who to cut. Normally, in order to make an assessment, aid agencies would visit refugees regularly to analyze their needs. But the scale of the crisis has made this impossible, so many of the decisions are based on bio-data - basic information on the makeup or the size of families, including age, disabilities, work status, and negative coping mechanisms. “The criteria are based on a combination of elements, including family composition, the presence of family members with specific medical conditions and the overall ability to provide for the family’s basic needs,” Russo said. She stressed UNHCR is trying to make the appeals process adjustable to avoid mistakes. While she emphasized that they are doing their best to ensure no one falls through the cracks, both UNHCR and charities stress the importance of the appeals process in limiting the number of people wrongly cut off. Every person facing the cut is given an appeal form, with over 100 drop-off boxes across the country. Charities are helping illiterate refugees fill in the forms. Chadraoui acknowledged “this is not a 100 percent perfect system”, but said the appeals process was “very robust”. All the refugees who file an appeal will be visited, she said, and their situation assessed within one or two months. Those living in remote areas 500m or more above sea level would also be visited, Chadraoui said, whether or not they have appealed, in order to ensure those who need assistance are re-included before the start of the harsh winter. *This story was amended on 21 October 2013.